Back in February (see post) numerous equity investors refused to believe that a crude oil recovery is likely to be unsustainable. Many viewed this as a buying opportunity - just as they did in 2011 when such "bottom fishing" strategy worked. "Look at the declines in oil rigs" many argued - US crude production is about to dive. Even some in the energy business were convinced that crude oil recovery is coming and we will be back at $70/bbl in no time. It was wishful thinking. 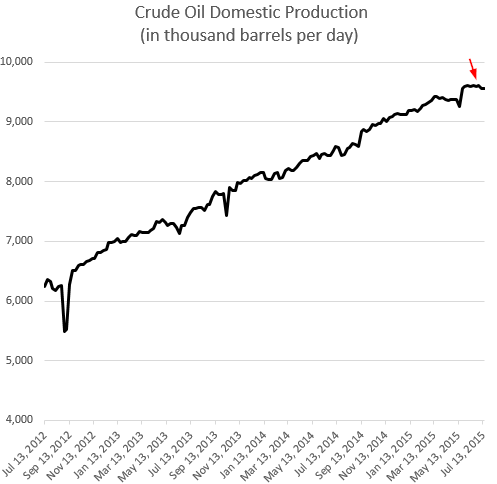 There is no question that North American production of crude oil is stalling. However for now it remains massively elevated relative to last year. More importantly, many fail to understand just how flexible US crude production has become - the time to bring capacity on/off-line has shrunk dramatically. 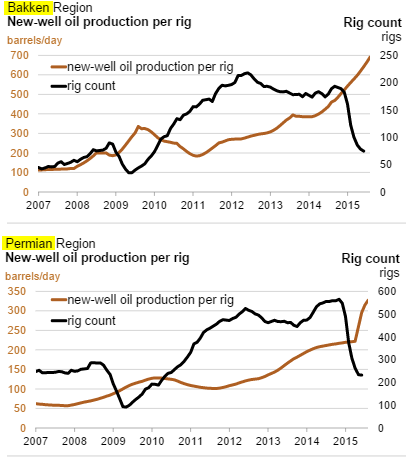 Furthermore, a great deal of production in the US is now profitable at $60/bbl and even lower as rig efficiency rises. Many view this as unsustainable because new exploration is halted and existing wells are being reused. But there is enough staying power here to continue flooding the markets for some time to come. 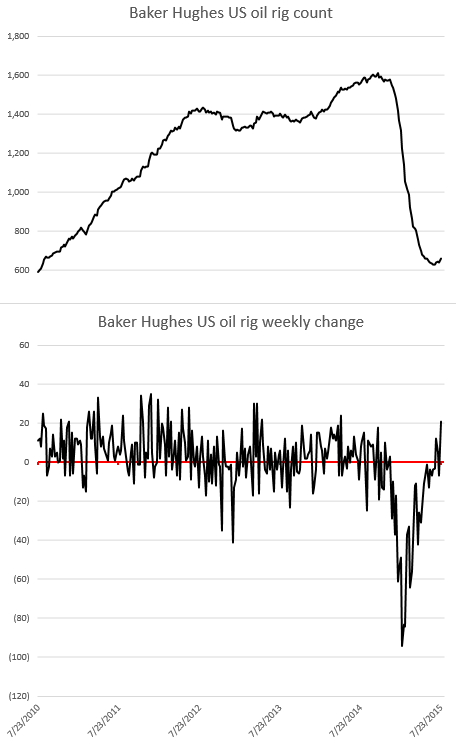 The ability to bring capacity back online quickly is the reason we saw US rig count unexpectedly increased last week. 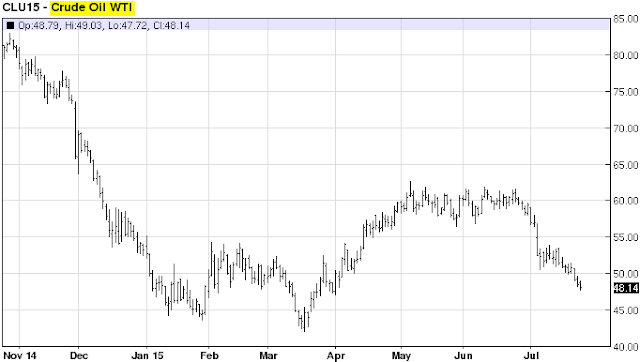 This creates a natural near-term cap on crude prices, above which production can rise quickly. 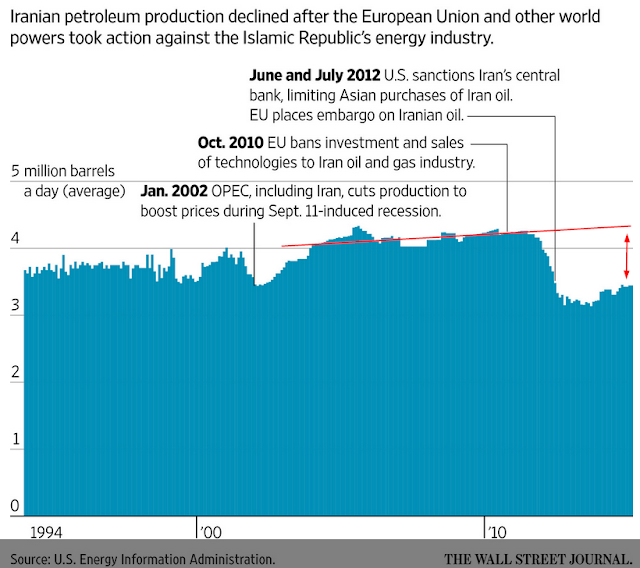 To add to the market's woes, the Iran deal threatens to bring materially more crude into the market in 2016, while immediately releasing a great deal of stored crude the nation currently holds. 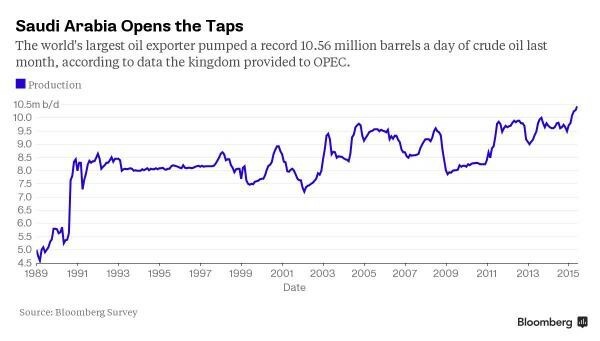 Moreover, the Saudis are ramping production to record levels, as the OPEC members are left to fend for themselves. The Saudis will attempt to recover some of the lost revenue with higher volumes. Crude prices in the US fell below $50/bbl in response to some of these developments. So much for the "recovery". All of a sudden, as investors realize that crude oil price recovery could take years, energy firms, particularly those focused on exploration and production (upstream), don't look that attractive. 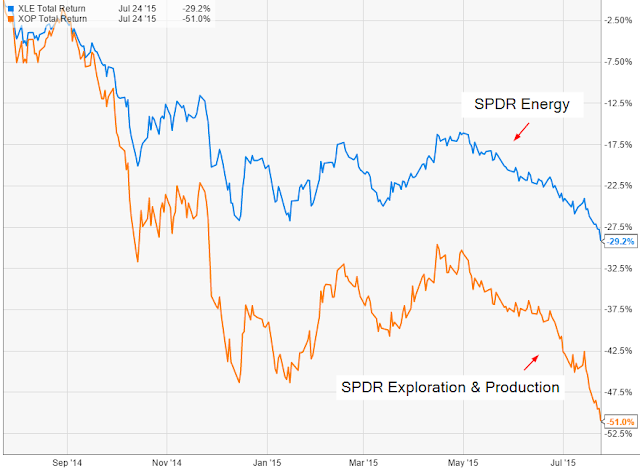 The chart below shows the relative declines of the overall energy sector as well a the upstream companies' shares over the past year (down 29% and 51% respectively). And even those who were betting on the M&A activity providing support to share prices are having second thoughts, now that the Backer Hughes acquisition by Halliburton may face challenges. 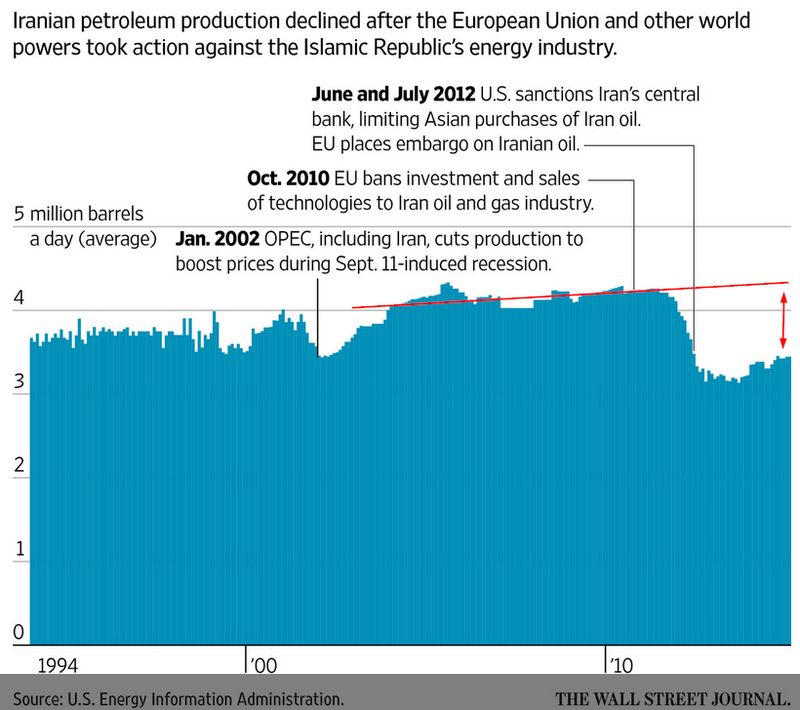 To make matters worse, many energy firms continued to borrow as prices declined. With no recovery in sight, credit markets are becoming much less forgiving. 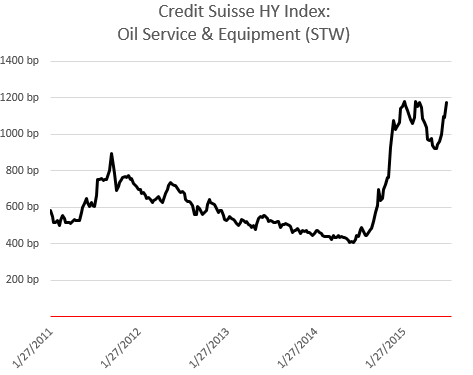 In traded credit markets for example we see spreads widening out again - with oil services and equipment getting hit particularly hard. The US energy industry is undergoing its most challenging period in decades and for many firms the worst is yet to come.